On this podcast, we are joined by Michelle Patt, an early childhood educator, consultant, and writer. Her work emphasizes STEAM (science, technology, engineering, arts, and mathematics) learning through exploration and experimentation. She writes about the integration of art and science into preschool classroom activities to encourage children’s problem solving and innovation. Michelle is preschool supervisor at Howard Area Community Center, a Preschool for All and Head Start braided program in Chicago, Illinois. She joins us to discuss strategies for encouraging young children to engage in purposeful play. She blogs about her work at Explore Inspire EC. Thanks for joining us for a podcast from the Illinois Early Learning Project. Our project is part of the Department of Special Education at the University of Illinois at Urbana-Champaign and funded by the Illinois State Board of Education. On this podcast, we share information about how young children grow and learn as well as strategies adults can use to help them thrive. My name is Rebecca Swartz, and I am one of the project staff members. Rebecca: Today, we welcome Michelle Patt. Michelle Patt is an early childhood educator, consultant, and writer. Her work emphasizes learning through exploration and experimentation. She writes about the integration of art and science into preschool classroom activities to encourage children’s problem-solving and innovation. Michelle is preschool supervisor at Howard Area Community Center, a Preschool for All and Head Start program in Chicago, Illinois. She joins us to discuss strategies for encouraging young children to engage in purposeful play. Michelle, we’re so excited to have you here on the Illinois Early Learning Project podcast, and we’re hoping you can start us off by telling us a little about yourself and your journey to becoming an early childhood teacher and leader in the field. Michelle: Yes, I’m so happy to be talking to you, too. I am a preschool administrator at Howard Area Community Center, which is the Head Start/Preschool for All program on the north side of Chicago. Before moving into administration, I taught preschool in toddler and preschool-aged classrooms for a little over 15 years. One of the things that I found when I was teaching is that I was having all these rich conversations with colleagues about what to do in the classroom, but things that were most interesting about these conversations wasn’t what materials to bring into the classroom. Which is something teachers always want to focus on, is well, how do you actually decide what to do with materials? So through these conversations with my colleagues in my center and in other centers, I came up with the idea of starting a blog that would talk less about what specific materials to choose for the classroom or how to set up a craft activity, and more about the process that teachers go through when trying to decide how to approach materials, how to interact with children, and how to focus on what the children are doing with those materials through their play. Rebecca: Neat. So we’ve noticed that your blog really focuses on explaining how children play and interact with materials, their environment, and peers in a meaningful way. Can you tell us what you call this kind of play? Michelle: I tend to call it purposeful play, and I think lots of times when we’re thinking about children’s play, we’re focusing on the kind of catch phrases that children learn through play, and play is children’s work, which of course it is. But there are different aspects of play. Play by itself is a joyful, enjoyable activity, and play can be valuable for just for the joy and experience children have. But there’s also a different aspect of play that really involves learning. So I think play in terms of purposeful play that is actively scaffolding children’s learning. 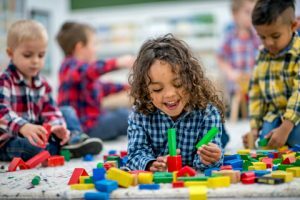 Not to say that the other types of play aren’t important, but when children are involved in purposeful play or another way of thinking of it is process play, they’re building skills that are leading toward a certain goal. And it might not be a goal that the teachers have set for them, it might be the goal that the child has set for themself. Like for instance, a child who approaches blocks with thinking, “I want to build something with these blocks.” It might not be a defined something and is certainly not being defined by the teacher, but the child’s approaching those materials with some sense of planning, some sense of time management, some sense of deciding what they’re going to do with those materials. Rebecca: All right, so, it sounds like there’s many big benefits to children about these opportunities to explore in these open-ended ways. You talked about children planning, and you talked about understanding that children may have an agenda. Are there any other benefits to this type of play that you think teachers should consider? Michelle: There are really so many benefits, and it’s really across developmental areas, because having the opportunity to, well, children having the opportunity to explore the materials themselves gives them a chance to develop all sorts of skills related to self-regulation and executive functioning. Because when we put out, when we as teachers put out materials or activities for children, they’re following our agenda, and there is a lot of development of cognitive skills and social interaction that can come around those, but the real rich development comes when the children are discovering the problems for themselves. Like for example, I can put out an activity on the table and give children directions on how to sort something, and they’ll be able to do it. But if they’re approaching materials, that let’s say they are not all that familiar with and I just say “I wonder what you can do with this.” That opens up a whole different set of cognitive—access to cognitive skills—because the children are having to do planning, they’re having to think about what they’re doing. They’re having to do a different level of social negotiation with each other as they figure out what they should do with these materials together. And so it adds a different layer of opportunity for problem-solving and social negotiation skills and language, as the children are figuring out what they’re doing with these materials. Rebecca: So you’re really encouraging teachers to curate the environment in a way that allows for children to access these higher level skills. Rebecca: So they’re kind of like, almost like a museum or setting up a display that children will interact with, but they don’t necessarily know where the play is going to go. Michelle: Right. Since teachers do know the children who are in their classrooms, they have a pretty fair idea of where the play could go and even where they want it to go. I think one of the things that is challenging for teachers with dealing with process play is trying to figure out that balance between the teacher’s agenda, because there are those skills that children need to learn, there are standards that, there are standards that we want to follow in the classroom, there are things that we know that kids need to learn, but at the same time we want to value the children’s ideas and figuring out where to blend that together. So one of the things that I encourage teachers to do is really think about not only what the materials are but what the children will do with those materials. I like to call it planning with verbs. So lots of times we focus on “What thing am I bringing into the classroom, what materials am I going to order for my classroom?” but focus too on “What is it that we see children do?” Focus on the verbs. Rebecca: That’s really interesting. So focus on the verbs, and try to think about “What might happen, what children might do?” The actions that they might carry out. Michelle: Right, and I think one of, the areas where it’s sometimes easiest for teachers to get started thinking about this are in concepts related to math or science, where we’re already doing a lot of hands-on things with children. So for instance, I brought up block building before, that when observing children in the block area, are children building tall structures? Are they wanting to incorporate cars and experiment with things that roll? Are there other types of schemas that they are using like rolling objects, sliding objects. With very young children, building towers to knock them down, which we know is something young children do as they’re exploring basic concepts of physical matter. And so, starting by looking at what the children are doing with the materials and thinking about ways to enrich that and what other materials to add on to what they’re doing. And this can also be in other areas, too, like I brought up math, you know. We very often focus on, oh can children make patterns? Can children sort? Can children count? So noticing that other children who might be interested in sorting objects, what sort of objects can you give them so we can give them the opportunities to practice those skills of sorting, categorizing, subitizing—those skills. Rebecca: And I know you mentioned that you are a Preschool for All site and a Head Start site, and there are standards that teachers need to meet. And at our project, we spend a lot of time trying to help teachers in programs use those Illinois Early Learning and Development Standards in their planning. So it sounds like, maybe by focusing on the verbs, and what children might do with the materials, is one way that teachers can start to give those process opportunities to children in the classroom. Michelle: Right, exactly, ’cause the standards don’t say that the teacher needs to be deciding how the child will, for instance, you know, bringing up sorting as an example. The standards don’t say how the, the standards don’t say the teacher needs to tell the child how to sort. The standard is that children should have experience with sorting objects. 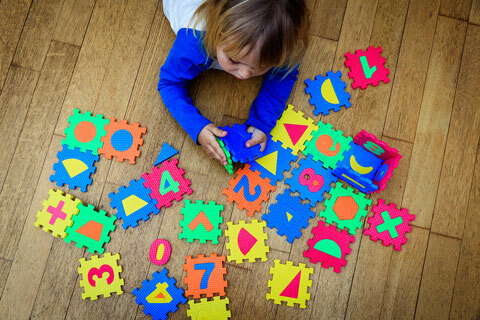 So, the teacher can follow the child’s lead and provide opportunities where the child can figure out what schemas they’re using to sort objects, and teachers can provide different objects for sorting, rather than setting up a sorting activity for the children or giving directions on how to do it. Rebecca: Sure, so we know that we don’t have to just sort those color bears by color or size, but rather, we can ask children then to look at a set of objects and come up with the schema or the criteria for sorting that makes sense to them. And as you said, that’s a richer experience, that’s when we are really doing those standards. And so drawing out some of that math and science language, but also using that language with children to encourage concept development. And I think that’s where this sort of play can really get at some of those higher level standards, because the children are having to do a lot more planning on their own. So we are moving from the skill of can we sort, can we count, to children being able to explain their reasoning and to get to some of the standards that have to do with higher level reasoning and thinking and language. Rebecca: That’s really interesting. Especially because then that gives children a chance to think about and talk about their thinking, which is important for them as they continue to progress through their schooling, to be able to be aware of their learning and that they are active in that process. So it sounds like you’ve talked about math and science and arts as opportunities to do this process play, as opportunities for teachers who are maybe a little unsure. Are there any other advice, or points of note, that you might want to tell a teacher who isn’t sure how to get started with allowing this type of process play in her planning? Michelle: Yeah, I always encourage teachers to start small. I think any time you are starting on a different sort of curriculum approach, it can be really overwhelming, that there’s a lot of ideas out there, a lot of materials out there. And just thinking about starting small, just maybe with one type of material in one area of the classroom. Like for instance, you brought up counting bears. Let’s say you have counting bears in your classroom, coming up with some other material that has different characteristics that you can just put on the shelf next to the counting bears. So it’s not a complete transformation of your math area, but just one material you’ve added to see how the children use that, before you move on to something else. Or adding something that is more open-ended into a dramatic play area. For instance, in addition to having whatever plastic or wooden food objects, some teachers might bring in a basket of pebbles or a basket of seashells and put them right next to them and see if the children start incorporating those into their play. And I think really, it is important to start small, not only to deal with any anxiety teachers have about this new approach, but also that gives teachers a chance to really observe what the children are doing and following the children’s lead in a different way than bringing a whole lot of different materials into the classroom at once. Rebecca: That’s really interesting because then also, it’s possible that children will come up with ideas, and it naturally flows to the next kind of opportunity to do this type of play. Rebecca: Okay. “I wonder,” and that’s a really important thing. “I wonder.” And that’s a very active verb, because it is wondering and possibilities. So I wonder if, I wonder as well, if you ever hear teachers worrying about how children are going to just make a huge mess. How might you help a teacher get past that barrier? Michelle: Well, I think that starting small just naturally helps get past the barrier, I think. Many times, those of us who have seen the photos of classrooms that are completely open-ended materials or loose parts can, even as adults just feel very overwhelmed that there is so much stuff. So I suggest things like starting small, with a small amount of materials. For instance when I brought up putting a basket of shells in the dramatic play area. It might be a basket that just has 12–15 shells in it. So something that won’t make so much of a mess that if it does get dumped out or if the pieces get scattered, it’s something that’s manageable for the children to be able to take care of the materials and for the teacher not to feel overwhelmed. Or starting some of these activities in a more contained space. I think another great area for starting this open-ended play is in the sensory table because that is where children will be doing open-ended, child-directed play, and one of the nice things about sand tables or water tables is they already have sides. So if you’re thinking, “Oh, what would happen if I brought a whole bunch of little pieces of pebbles or rocks or something else into my classroom? They’ll get all over.” Starting them in a container that has sides can give the children a chance to figure out what they’re going to do with them and give the teacher a chance to see what could be the next steps to moving them somewhere else in the classroom. So it’s almost like scaffolding, not only scaffolding the child’s play, but scaffolding the teacher’s development of this play, so that it’s in a controllable way. Rebecca: Yeah, so children are a part of the management, because they’re learning to use the materials as well, which includes being able to move them about and use them safely, and I think that’s a good point to start small, to start with one thing or a few things and then keep building on that type of play. Michelle: Right, and then it’s the teachers and children developing ideas together, because then once the children are used to using whatever the new material is in one area of the room and the teacher is also comfortable with how the material is being used, then the next step is to think, “Well, where else could we use this?” Like one of the things, when I think about things like the counting bears, children always want to bring the counting bears out of the math area and use them with blocks. And a lot of rich math activity can come up when they’re using them with blocks. Children, just all on their own will come up with ideas like seeing how they can compare the size of a line of counting bears with a unit block. 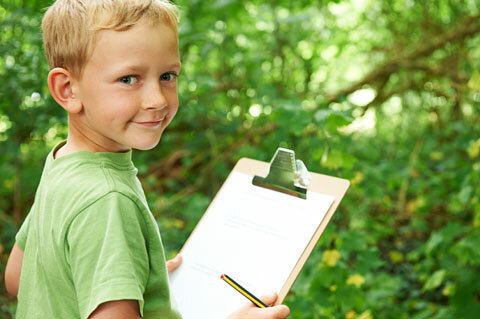 Those are the types of activities that if the teacher presented them, might not be interesting, but when the child comes up with them on their own, they’re really engaging. And so, having those opportunities to start using the material in one place and then teachers allowing them to be in another place can expand concept development. Rebecca: That’s so interesting, because free flowing materials can be really difficult for teachers who, you know, really want to help keep an organized environment, and they may not have thought about how allowing, you know, some movement of those materials, but also helping children learn to put them away and take them out, and allowing children to think about how they’ll use the materials could actually help the children become part of that process of maintaining that environment. So really interesting to hear about and to think about. I’m curious, you mentioned seashells, and you’ve mentioned pebbles, are there any other favorite materials that you often invite teachers to start with when they’re beginning this type of process play? Michelle: Let’s see, really I encourage teachers to look at what the children in their classroom are doing and what they are most interested in first, because the same materials do not necessarily work in all classrooms, or all children are engaged in them. Besides like thinking about these little objects, I also think about sensory materials in general, like sand, water, Playdoh, clay. These materials that children are already using in open-ended ways. So generally, when we put water in the water table, the teachers rarely have an agenda they put on the water. So children tend to approach water play already in a very open-ended, free-flowing way, and so I encourage teachers to think about, “What are the things in the classroom that children are already using in open-ended ways” and what they can add to that first. Rebecca: Right, I love that, because it’s again, it’s focusing on those verbs. What are they doing? And becoming an attuned observer, and then allowing the planning to flow from that. Michelle: Right, and part of this is also thinking about what the children and teacher can handle, and I think that sometimes we forget that in any conversation about curriculum ideas, that it is really important that the children are engaged in what the teacher’s bringing in, but also that the teacher feels that this is something that is manageable and that they can handle. And I think this is where—whatever we call this type of play—the kind of play-based approaches or process play, there is a lot of room for teachers to get overwhelmed and that can be a barrier to being able to encourage this type of play in your classroom. And, so, where the eventual goal should be that children can use a variety of materials in many areas of the classroom in open-ended ways in their play, but it can’t start there because teachers also need a chance to figure out, well, what are the routines that are going to go around this material. Like you had said, with cleanup, there are always, whatever the material is, whether it is a little bit of something or a lot of something in whatever areas of the room it is, teachers and children need to have time to develop a plan for, how will this get cleaned up at the end? And I’d say that’s part of the learning process in itself, too, because one of the things that is most valuable about this purposeful play is that children are part of the entire process, not just doing an activity, but determining together with the teacher what things they’d like to have in the classroom, how they’re going to use the materials. You know, this is when we start to see a whole lot of innovation, and I think another way I might talk about this type of play is innovative play, because if we are really talking about encouraging some of those what we call “the 21st century skills” or “STEM skills,” it isn’t just about problem-solving in terms of solving problems in an activity that is given to you, it’s the children coming up with what the problems are that need to be solved and solving them themselves. Which, in real life situations, are ever evolving. So determining how everything is going to be put away at the end or which materials can be moved from one area of the room to another is part of the learning process, not just an organizational tool, but that’s part of the social negotiation and the language development that the children are doing themselves. Rebecca: All right, well, you’ve given us so much to think about, and I’m sure that many teachers will find this very useful, and we will put a link to your blog so that teachers can take a look at what kinds of process play are going on in your school. I want to thank you so much for joining us, and we hope that we will have you back again on the podcast so that we can talk further about next steps that teachers can use as they explore this process play. Michelle: Okay. Thank you very much. Narrator: The Illinois Early Learning Project website at www.illinoisearlylearning.org is a source of evidence-based, reliable information on early care and education for parents, caregivers, and teachers of young children. Thanks for listening and for helping the children in your home, classroom, and community have a strong start in their early learning. Tip Sheet: Toys from Throwaways: Let’s Recycle!